When you're shopping for your next home, check the condition of each property's roof. Roof certifications are not typically included in a regular home inspection and they're not always stipulated in purchase contracts, either. Say you find your dream home, but it has a shabby roof. You'll probably want to question both the seller and agent, "How can you sell this house without a new roof?" 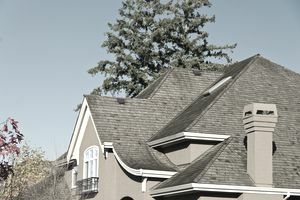 In certain cities, such as Sacramento, city regulations do not require that sellers replace failing roofs. Cities have Truth-in-Housing guidelines and regulations governing repairs before resale, so check for the cities in which you're buying or selling. In a seller's market, a home roof's condition might not matter; it could be raining directly into the living room through a hole in the roof the size of a basketball hoop, and home buyers in a seller's markets might still snap up the property. Whether you obtain a roof certification can be driven by the type of real estate market present at the moment. During market fluctuations, and often in seller's markets, a roof certification is not a buyer demand. In a buyer's market, though, it might be. If the roof does not require repairs, the roofing company will then estimate the remaining years of life for a roof and certify its inspection. The certification is good for two to five years, depending on local custom. If the roof does require repairs, after the repairs are performed, the roofing company will then issue the roof certification. There's always the chance that the roofing company could go out of business during the term of your roof warranty, so don't wait if your roof needs repairs that fall under the warranty. Roofing companies say that wood shakes often require more repairs if they are older than 10 years. Conversely, tile roofs can last 50 years, as long as nobody has walked on them because weight in the wrong places causes cracking and breakage. Composition shingle roofs are often warranted for 20 to 40 years, depending on the quality of the material. The steepness of a roof is known as its pitch. The higher the pitch number, the steeper the roof. To calculate pitch, measure one horizontal foot of the roof, following a level horizontal line. Now measure how much higher the roof is at that point, known as the rise of the roof, along a vertical line. If the roof rises 4 inches per foot, the pitch is 4; if it rises 12 inches per foot — a 45-degree angle — the pitch is 12, generally the steepest you’ll find. TIP: Many roofing contractors will charge extra to work on a roof with an extreme pitch. Some cities have enacted ordinances regarding the number of re-roofing layers that are allowed to be placed on an existing roof before a complete tear-off will be necessary. In California, for example, it's common to see composition shingles placed directly over wood shake. Although not all states require seller disclosures, if a seller does not disclose previous roof repairs, many roofing companies will refuse to honor the roof certification. Roof inspectors will want to examine a previous repair to make sure it was done correctly and won't cause future problems. Most roofing companies will not honor claims due to natural disasters or severe weather and these conditions include high winds in addition to damage caused by foot traffic or improperly installed skylights or solar panels. Natural disasters, however, are generally covered by either a homeowner's insurance policy or a flood insurance policy. Many sellers are advised to provide a roof certification to the buyer as part of the sales process. Roof certifications give buyers peace of mind. If sellers refuse to provide a roof certification, and the roof is older, home buyers might decide to pay for their own inspection and make it a contingency of the sales contract. Some controversy exists over whether a roofing inspector should also be allowed to perform roofing repairs because of possible conflicts of interest. If a seller is unhappy with the recommendations made by a roofing contractor, it's advisable for the seller to obtain a second inspection and submit both inspections to the buyer. Will a Seller Make Repairs in the Verification of Property Condition?